School officials have issued warnings to parents ahead of the second season of the Netflix drama "13 Reasons Why," which premieres this week. The first season, which centered on the suicide of a high school student, triggered cautions from the National Association of School Psychologists. Netflix has responded to concerns by adding PSA-style messages filmed by the cast and putting up a web site with links to resources. The national attention comes at a time when, new research suggests, one in five teens may have considered suicide. And school leaders are starting to recognize that they have a lifesaving role to play. Suicide is the second leading cause of death for teenagers. And experts argue it's more than just an individual mental health issue. It's a public health issue, affected by the web of relationships that exists in the place where most teenagers spend more waking hours than anywhere else. Take a new study published in the journal Pediatrics. Rami Benbenishty, Ron Avi Astor and Ilan Roziner analyzed hundreds of thousands of high school students' responses to the California Healthy Kids Survey, which students take in grades 5, 7, 9 and 11 across the state. It asks a range of questions about topics like bullying and feelings of belonging. On average, one in five students answered "yes" to the question, "During the past 12 months, did you ever seriously consider suicide?" This is known as "suicidal ideation" and is an important indicator of someone who might be seriously depressed, anxious, stressed or who may actually attempt suicide. This study was the first using this survey to look at rates of suicidal ideation within schools. The study was repeated across two waves of the survey, for extra reliability. Suicidal ideation rates ranged widely across schools in the study, from a low of 4 percent to a high of 67 percent. At the high end, that's 2 out of 3 students considering ending their lives. Schools with higher reported levels of victimization, such as bullying and fighting, had higher rates of suicidal ideation as well. So did schools with higher rates of victimization linked to discrimination — where students were targeted for their race, gender or sexual orientation. So did schools with more girls — girls tend to report a higher level of suicidal ideation generally. And here's what the study authors found most important: These school characteristics accounted for an individual's risk of thinking about suicide twice as much as the observable characteristics of the individual. "What this means is that we can understand the phenomenon of suicidal ideation far more when we include all the school factors," Ron Avi Astor, a professor at the University of Southern California, told NPR. And that implies, the authors wrote in the paper, that "it is possible that certain school characteristics either enhance or buffer the influence of individual characteristics." These findings are new. And they have a few different implications for policy, Astor told NPR. First, the wide range in rates of suicidal ideation, from 4 to 67 percent, suggests resources ought to be targeted to those schools at the high end of that range. Second, he said, suicide prevention should go hand in hand with other school-climate efforts targeting bullying and discrimination. "We need a new type of setting-oriented intervention around climate, welcoming, warmth, community," he says. California is one state that's focusing more attention on this issue. After a series of high-profile clusters of student suicides in northern and central California, the state passed a law mandating schools to establish suicide prevention, intervention and "postvention" programs. Postvention refers to the steps a school takes after a loss. Doreen Marshall is a psychologist with the American Foundation for Suicide Prevention. Her group just released a new edition of a toolkit for schools: "After a Suicide." It focuses on postvention and preventing contagion. "Adolescents really look to their peers for signals on how to be in the world," Marshall says. "When they lose a peer by suicide, kids may identify with the person who died." Put an appropriate time limit on spontaneous memorials, including online message boards or shrines at school, to avoid glamorizing or romanticizing the student who died. Be sensitive to cultural differences in attitudes toward death and the morality of suicide. Communications to the media should include warning signs, information about community resources and messages of hope and recovery. Share accurate information on social media, to stop rumors. Use social media to share resources, promote prevention and to respond to rumors and to students who may be at risk. "Schools need to have suicide on their radar," Marshall sums up. "At any given moment there are students in their school who are having suicidal thoughts, who are engaging in suicidal behaviors. We want schools, as the gatekeepers beyond families, to be mindful." Kimberly Israel is a coordinator of community outreach for the Escondido Union School District, a K-8 district in northern San Diego County. The district is part of a consortium working with Astor's research team at USC to apply research to school climate and safety. Her middle school students report a suicidal ideation rate slightly higher than the average — between 19 and 25 percent over the last several years. "When you start to calculate that out, it's a lot," she says. "You start thinking of actual students, it's just this kind of sad reality." They haven't yet been successful in changing the percentage of students who report thinking about suicide in Escondido. But, Israel says, there are other indicators of the positive impact they're having. In response, over the last decade, Escondido has increased its investment in social and emotional services and providers. "We decided about six years ago that our goal was to get our kids to understand the resources available to them," Israel says, "not only for their time in school, but as they continue on in college and beyond." To that end, every sixth-grader gets classroom-based lessons on depression awareness and suicide prevention. Parents are offered a free class at the same time, and teachers are regularly re-trained on spotting risk factors. The district strengthened its relationships with community mental health providers, including those who serve low-income families. And just about every day, says Israel, a staff member at one of the district's 23 schools is doing a formal risk assessment or an informal screening on a student who's been identified by herself, a peer, a family member or a staff or faculty member as being potentially at risk for suicide. In a formal risk assessment, parents are notified and a referral is made to services inside or outside the school. Or, if the need is severe enough, a student may be recommended for hospitalization or even committed involuntarily. As a result, more students are receiving mental health services. Students report feeling safer and more connected to school. Student behavior is better. 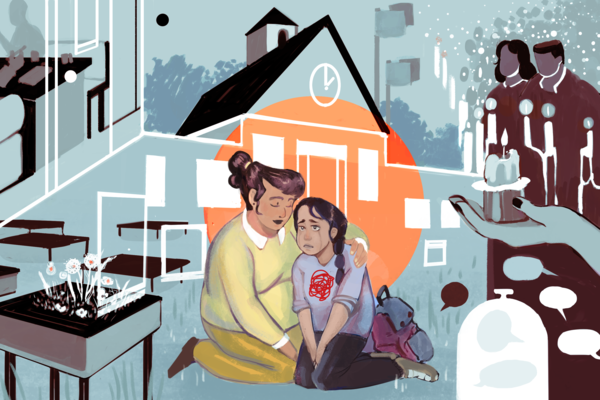 They do all this with 27 social workers, 10 school counselors and a handful of school psychologists, plus their community agency partners — for 16,000 students. "It's not big on paper," Israel says, but the ratio of students to providers compares favorably with other districts in the county (and across the country, for that matter). Across the schools that Astor's team studies, moving the needle on suicidal ideation has been tough, he says. "Our whole way of thinking as a society is focused on the individual level rather than the setting level." Districts like Escondido have "great resources" to respond to threats once they're made known, but "it makes lots of sense that even gold standard districts have a hard time lowering this earlier warning flag." He said that his new study suggests creating schools were fewer students are bullied, and paying attention to student composition, could start to improve prevention efforts. But, more research is needed.